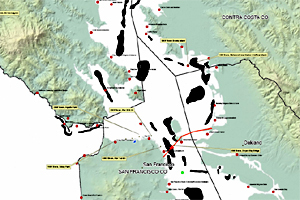 Areas where the oil spread after the spill. See this map and others. November is the month when thousands of migratory birds on the Pacific Flyway make their stop in the San Francisco Bay Area. It’s also the month when herring arrive in the Bay in gigantic schools – tons and tons of the tiny fish. It’s the month when salmon make their way into the bay, on their way to spawn upriver. And November’s the month last year when the Cosco Busan crashed, leaking 53,000 gallons of black goo into San Francisco Bay. So biologists will be particularly attentive this November, one year after the oil spill, to see if there’s a noticeable dip in the numbers of herring in the Bay, or the number of migratory birds that alight here. The number of birds harmed by the oil spill is not really known. More than 2,000 birds were killed – but those are simply the birds that were identified, not the total number. Since many dead birds in remote areas were never found, and since predators took away many of the hurt birds, the estimate for the total number of birds harmed by the spill is many times higher than that. So researchers are conducting experiments to determine a provable, scientific estimate of the number of birds killed or harmed by the oil spill. According to California Fish and Game scientist Julie Yamomoto, it only takes a spot of oil the size of a nickel to harm a bird. It’s not just uncomfortable, she says, it’s actually lethal – because the oil is like a hole in a wetsuit, and birds that have been oiled become hypothermic. And they also lose buoyancy, so birds can actually sink and drown in the ocean. All the experiments and data on habitats, fish, birds and other wildlife will be compiled into something called the Natural Resource Damage Assessment. It’s nicknamed NRDA (pronounced “nerd-a”) and that’s pretty apt. It’s a little wonky, to say the least. The data is supposed to be completed by the end of next year, and then the NRDA report is expected to be compiled and submitted sometime in 2010. Listen to the Oil Spill Anniversary radio report online. Save The Bay is co-hosting a panel TOMORROW, NOV 7—the anniversary of the oil spill—at the Commonwealth Club in San Francisco. Moderated by Save The Bay’s Executive Director David Lewis, the panel will discuss what reforms still need to be made to protect our beautiful natural treasure. Call the Commonwealth Club at (415) 597-6705 to make a reservation.